Set in the early 1970s in the fictional Gateway City he created in A Taste of Honey, Only the Strong reads like Jabari Asim’s love letter to his hometown of St. Louis. Gateway City is changing. The decay of the north side of town has already begun. Mill Creek Valley had been demolished and the promises of new housing and business developments in that area have been broken. The revolutionaries that once fought for civil rights have moved within the establishment and are now politicians. The segregated businesses of previous years have gone by the wayside and there’s even a black woman working at the lingerie counter at the local department store. Only the Strong is centered around Guts Tolliver, former enforcer for local kingpin, Ananias Goode. Following the assassination of Martin Luther King, Jr. Guts finds that he no longer has the heart for breaking legs and killing his fellow man at the bequest of his boss. With Goode’s blessing, Guts instead spends his time running a taxi service and thinking about Pearl Jordan and banana pudding. Still, he keeps his ear to the ground, always aware of what’s going on around him, and always on the lookout for things or people that might bring harm to Goode. Tolliver’s days start with feeding the ducks at Fairgrounds Park and catching up with the locals, like the two women that tend a memorial garden daily, and observing the quiet fisherwoman that never seems to move from her spot. Guts has just been hired to babysit Rip Crenshaw, a star player for the local baseball team, which would be easier if Rip wasn’t such a wild card. A missing ring causes more trouble than Guts is sure Rip is worth, but he promises him that it will turn up eventually and he’s a man of his word. Guts’ interactions are often entertaining but never more so than when he’s visited by Playfair, a local booster. Playfair is a lighthearted hustle man who peddles his wares out of his car. He immediately brings to mind a charismatic Huggy Bear-like character. In addition to Playfair, there’s the cast of characters that always seems to hang around local businesses: the three gentlemen that hold court in front daily, including a man that works across the street but always seems to be at the cab stand; Nifty, a petty thief whose life Guts once spared and now uses an informant; and others in the neighborhood that stop by to chew the fat. Dr. Artinces Noel is a model citizen. Once a quiet girl from Honey Springs, Kentucky, she’s now a respected pediatrician in Gateway City. During her tenure in the city, she’s worked her way up to the head of pediatrics at Abram Higgins Hospital. While no one bats an eye at the doctor taking in Charlotte Divine, a sullen teenage, the city would be scandalized to learn of who’s company the good doctor is keeping behind closed doors. Most of the main characters are struggling with insecurities. As strong as he is physically, Guts can’t seem to find the wherewithal to meet the demands Pearl has placed on him. Charlotte’s abandonment as a baby has left her doubting whether or not anyone can truly care for her and she protects herself by rejecting people before they can reject her. Even Rip has problems believing that people like him and not his money or fame. Their insecurities don’t serve to make them weak characters; they’re more humanized because of them. I could go into comparisons between Guts and other male protagonists like Walter Mosley’s Easy Rawlins or Brawley Brown or Attica Locke’s Jay Porter, but I won’t. Guts is a great character in his own right and there are really no comparisons to be made. As I read about him cruising down Natural Bridge or Delmar, crossing over Vandeventer or venturing across the bridge, while listening to the Man in the Red Vest, I couldn’t stop thinking about his next adventure in the Gateway City streets. Asim has created all of these great characters that have stories to tell and stories I want to hear. 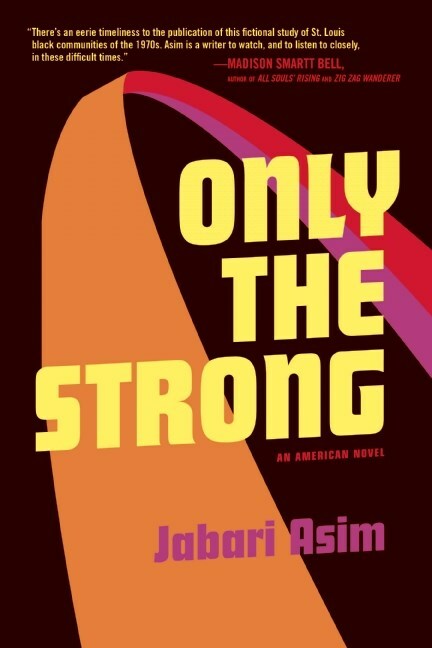 Yes, I have a deep affection for stories set in St. Louis, but I would venture to say that Only the Strong is one of those books that resonates with you regardless of whether or not you have a connection to the area.